Nestled in the heart of the South, is Capital Atlanta’s Technology and Demonstration Center. This 17,000 sq. ft facility houses many state of the art metal fabrication machines and is equipped with advanced training capabilities. Many companies are recognizing the profitability, quality, and dependability of OTC Daihen’s Robotic Welding Technology. Capital Robotics offers a wide variety of this technology in their Exclusive line of Fusion Arc Robotic Welding Cells that are part of their Robotics Training Lab. This Robotics lab provides a quiet and comfortable classroom and shop floor setting. This allows the students to escape the distractions and frustrations of the everyday hustle and gain the ability to properly and efficiently learn to program their new investment. Capital understands that you can have the most advanced machine available, but if you don’t have anyone trained on running it properly, you will likely not get the results you are looking for or end up hurting the machine or their operators. One of the many ways that Capital Robotics distances itself from the competition is to offer a “Worry Free Training Guarantee”. With the Purchase of every NEW Fusion Arc Welding Cell, the customer will receive up to 2 seats of training per year at the Capital Robotics training facility at no additional charge. This will help to allow a customer to protect their investment by having the ability to keep someone operating the Robotic Welder who is up to date with the function, safety, and maintenance of the machine. 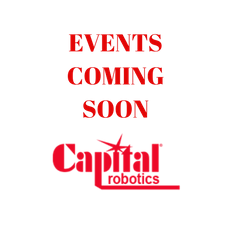 For Capitals “5 Year Worry-Free Preventative Maintenance Program” see the Capital Robotics Service Tab. During Capital Robotics Training Class, students will gain hands-on experience with the user-friendly programming and the state of the art welding technology. With Capital Robotics partnered with OTC Daihen, we can provide a single source solution for not only the robot, but also the welder, torch, wire feeder, consumables, parts, no charge phone support, and onsite services. But most importantly, Capital is a Single Source Training Solution. Providing safety, programming, advanced programming, welding, troubleshooting, and maintenance training all wrapped up into one 4-day session. In addition to our in-house training program, Capital also offers training at your facility. We welcome you to contact our Tampa headquarters for price and availability.